Bharat Petroleum Corporation Limited Released BPCL Recruitment 2018 Notification for 147 General Workman B Trainee and other Vacancies. Interested candidates can check the total details. And then go on to apply for the BPCL openings 2018 without any delay. Starting from 12th November 2018, the candidates can start applying for these General Workman B Trainee, Chemist Trainee, Operator Trainee Posts. Well, the Final date to submit the application form in the prescribed format is 26th November 2018. So, go ahead and get all the important information. And then submit the application form without missing. 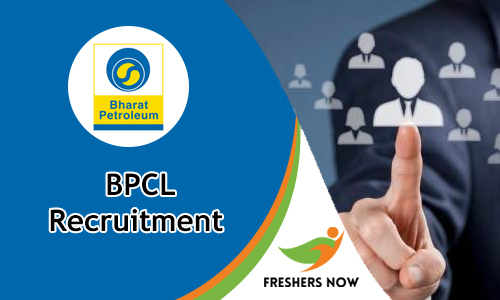 Bharat Petroleum Corporation Limited is accepting the Applications for the BPCL Recruitment 2018. So, if you want to get the job as General Workman B Trainee, Chemist Trainee, Operator Trainee, you have to apply before the closing date And before applying to try to check all the requirements. So that you will not face any issues of not getting accepted. Because the officials of BPCL Clearly mentioned that they are going to accept the applications of the people who are having all the requirements clearly. So, our team mates from Freshers Now are trying to provide all the details about BPCL Recruitmnt 2018. So, if you are also wanting to find out whether you are eligible to this Openings or not, check the complete details. To apply for the available postions, the candidates shuld have the correct Educational Qualification, then only they can proceed to check the remaining Requirements. So, according ot the information in the Notification, applicants have to finished their M.Sc. (Chemistry) preferably in Analytical Chemistry iFirst Class with 60% marks / First Class Diploma in Chemical Engineering/ Technology for more details check the advertisement. Next to the educational Qualification, an individual should check aout the age limit. As per the data in the Recruitment advertisement, an applicant age can be between 18 years to 30 years. Officials are going to conduct the Writen Examination followed by the Skill Trst. An individual will go to the next level only when they clear the before rounds. So, prepare well for the Selection rounds. The salary for selected people will be between Rs.11,500 to Rs. 31,000/- Per month. check the steps we are providing in this section. And they are going to help you in applying for BPCL Recruitment 2018. Go to the official site of the BPCL at bharatpetroleum.com. There you will find the recruitment advertisement. And submit it before the closing date without forgetting. We hope we do provided enough information about the BPCL Recruitment 2018 Notification. Check more such details about various Government Job Notification y following us daily. The candidates who are looking for the BPCL Recruitment 2018 can check the details on this page. Present all the contenders are seeking for the Central Government Jobs. For those candidates, the Bharat Petroleum Corporation Limited Jobs is a good source to enlight their career. Candidates who are going to apply for the BPCL Job Openings 2018 have to check the eligibility details first. So on this page, we have given some useful stuff like BPCL Educational Qualification, Age Criteria, Age relaxation, Bharat Petroleum Selection Process, BPCL Jobs Salary details, Steps to fill www.bharatpetroleum.com application form 2018. Go through the following page and pick the useful particulars without any confusion. Moreover, the applicants can download the official notification from the below link which we have given on this page. For the BPCL Recruitment 2018, the officials invite the applications from the candidates in the online mode. The Bharat Petroleum jobs 2018 is available on this page. Interested candidates have to apply in the mentioned dates. This is the right place for the applicants who are applying for the BPCL Jobs 2018. The contenders should have the minimum educational qualification as per the requirement. Candidates who are eagerly seeking for the Bharat Petroleum Corporation Limited Jobs either full time or part time can check the recruitment details from this page. On this article, we have given the latest BPCL Job Openings List so interested candidates can come across the details and apply for the suitable post. Now the candidates have reached the right destination to know more about the BPCL Recruitment 2018 for freshers and experienced candidates. All the aspirants can check the information about the education qualification at this point. Contenders who completed the Full-time Diploma Course in Chemical Engineering/Technology, Mechanical/ Electrical Engineering, BE, B.Tech, Graduate, Postgraduate, ME, M.Tech from a Government Polytechnic or equivalent Government recognized Institute approved by AICTE. And for the Medical Officers positions, the applicants have to possess MBBS degree from the recognized university of Medical Council of India. And should have registered with the Travancore Cochin Medical council, Trivandrum. This is the best opportunity for the freshers as well the experienced aspirants to the applicants don’t miss this chance. Bharat Petroleum Corporation Limited is an India Oil and Gas company. BPCL headquarters are located in Mumbai, Maharastra. BPCL is a Fortune 500 company and also a leading Navaratna Public Sector Company in the dynamic and exciting energy sector, engaged in Refining, Marketing and Distribution of Petroleum products and also in exploration of Oil / Gas. Bharat Petroleum Corporation Limited is a one of the Largest company in India. The candidates who want to flourish their career can explore their strengths with the BPCL. The BPCL will provide the reliable opportunities for the personal and professional development of the candidates. The company not only provide a job but also offer good salary according to the skills of the aspirants. The candidates who had completed their education for those candidates the BPCL Careers 2018 will help a lot. Actually, this is time to disclose the notification to the candidates who are trying to get the job in the Government Sector. Apart from the normal recruitment, the BPCL will recruit the candidates through the GATE 2018. Actually, for the Management Trainee positions, the officials will recruit the mechanical engineering aspirants thorough Gate score. The candidates who are applying for BPCL Recruitment through Gate 2018 have to mention the Gate score on the application form. BE, B.Tech, Graduate, Postgraduate, ME, M.Tech, Full-time Diploma Course in Chemical Engineering/Technology, Mechanical/ Electrical Engineering from the Government Recognized university. For every position, the education qualification may vary so please check the official website once. The aspirant minimum age limit should be 18 years and the maximum age limit may vary. Age Relaxation will also applicable for various posts. 5 years for Sc/ ST aspirants, 3 years for OBC candidates, and 10 years for PWD candidates. To recruit the candidates the officials will conduct some of the rounds in the selection process such as Written Test followed by the Personal Interview. Sometimes there is the chance to conduct the Group Discussion to filter the candidates. Our advice to the candidates is to be ready to face any round. The BPCL Syllabus 2018 and BPCL Previous Papers help the aspirants to give their best in the written test. For the selected candidates, the officials will offer the pay scale as per the rules of the organization. In addition to that, the other allowance is payable. While submitting the form the candidates have to pay the application fee as prescribed. The application fee may vary for every post. So go to the official notification and come to an idea. First, the candidates have to go to the official website of Bharat Petroleum Corporation Limited that is www.bharatpetroleum.com. Place the cursor on the “Career” tab a drop down menu will appear. Click on the “Current Openings Tab”. Now the latest openings appear on the screen. The applicants have to check the choose the suitable job and apply for it by using apply now option. At last, take a printout of the application form for the future use. Be in touch with our website www.freshersnow.com for the latest BPCL Recruitment 2018 Notifications. Candidates can also check the other Central Government Jobs from our website if any of the aspirants are not interested to work in this organization. The contenders can Bookmark this page.